Yesterday, God's good morning kiss to me was waking me up to see the first peach colored glow of the sunrise through the uncovered window in the stair landing. then snuggled back into drowzy comfort for a few more moments of delicious sleep. That was my first clue that it was going to be no ordinary day. It was a day to remember, ponder, savor. 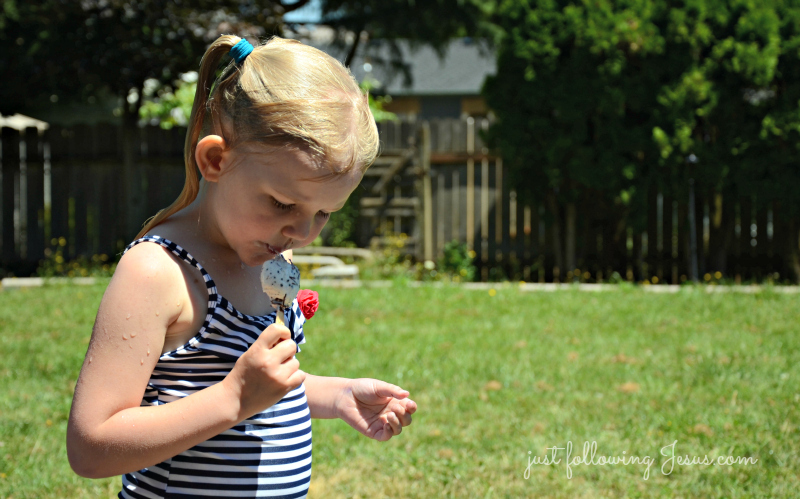 It was as perfect a July day as one could have in this imperfect world. 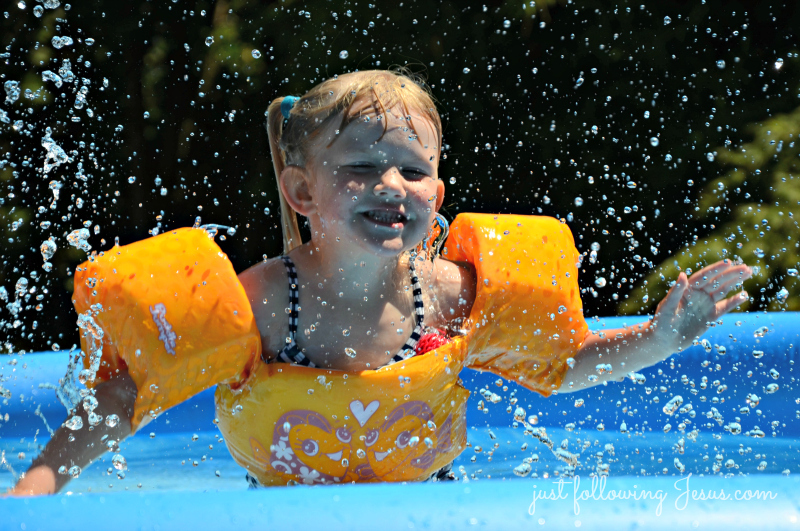 It was a summer day that defines those two words, "summer day". It was hot, but not too hot, it was "just right" degrees. 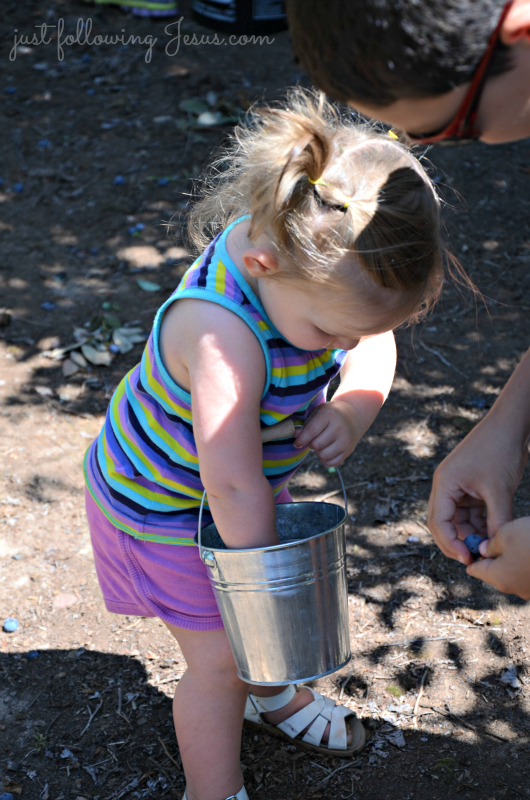 It was a perfect, load up the grandkids and let's all go blueberry picking day. Big grandkids kindly helped their little cousins. 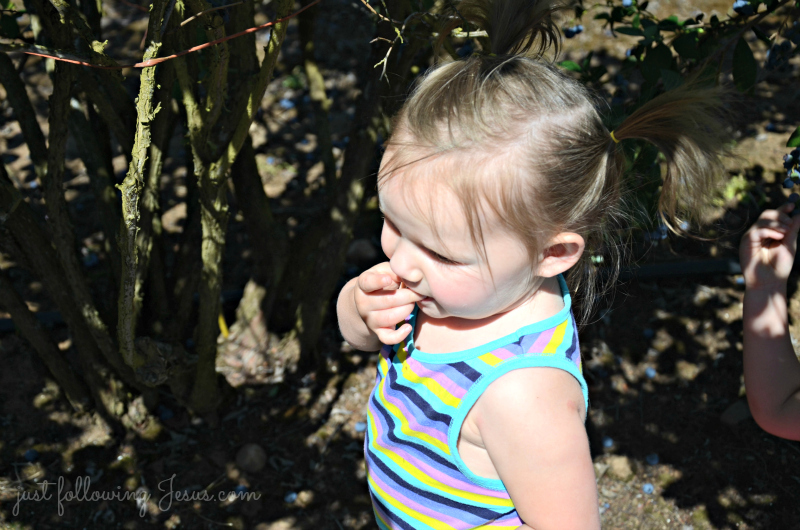 Little ones ate their weight in blueberries. Buckets of blue were gathered to freeze, so in the coming winter we can taste this day once again. 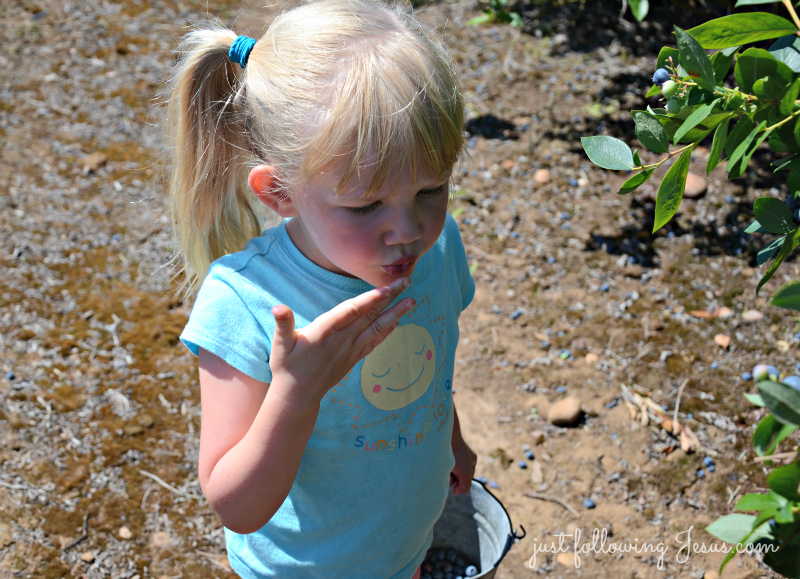 last summer when we picked blueberries. Next summer, there won't be much baby left in her. imprint this summer day on my heart, God. 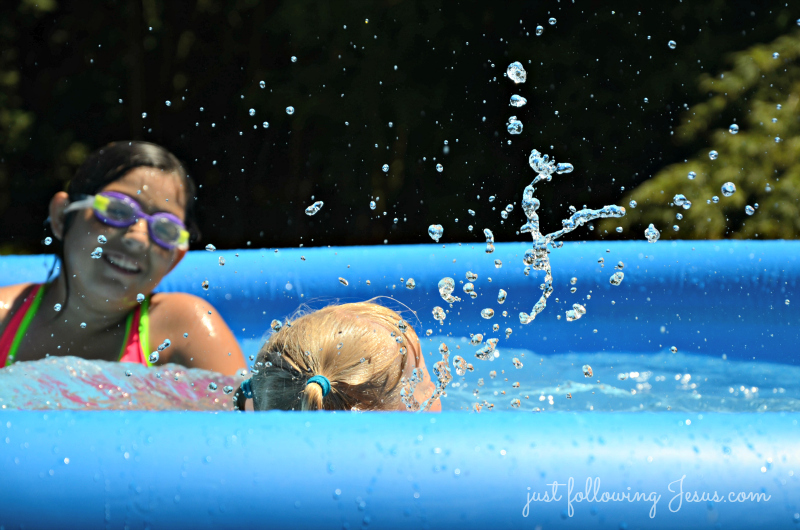 Why bathe dusty feet and wipe blue stained faces when a summer swim will do the trick? 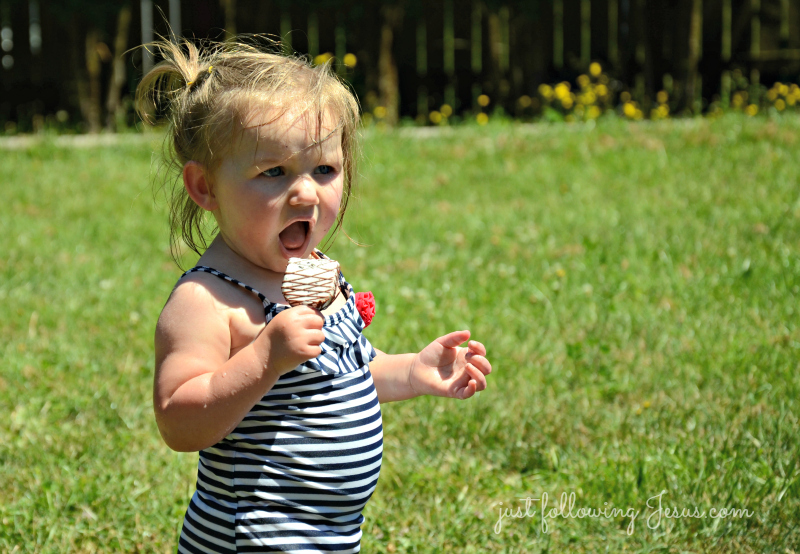 And a perfect summer day is no time to worry about nutritious snacks when there's ice cream bars in the freezer. 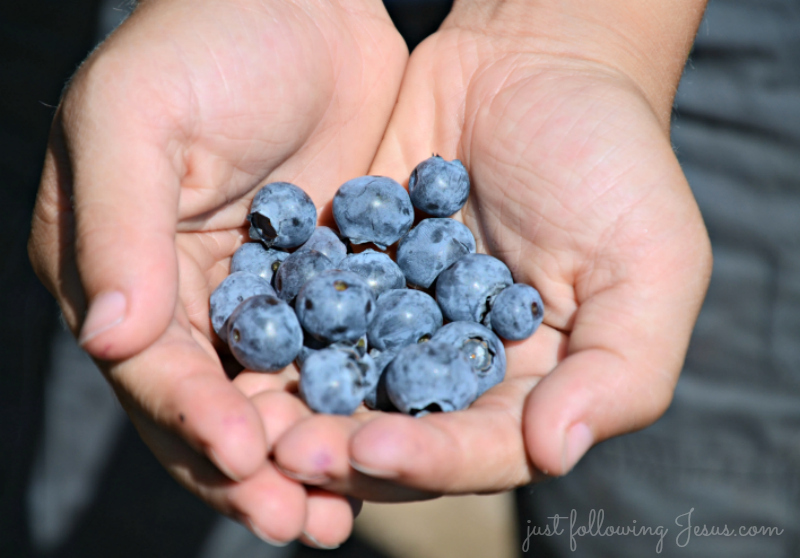 After all, pounds of anti-oxidant filled blueberries are already nourishing little tummies. that was anything but ordinary. when God's good morning kiss to me was that peach colored sunrise. Elizabeth, you blessed a grandmother's heart. Thank you. Why hello to you Elizabeth, and another Nana, too! So glad you enjoyed this. Oh such lovely words! And the sweetest little faces! 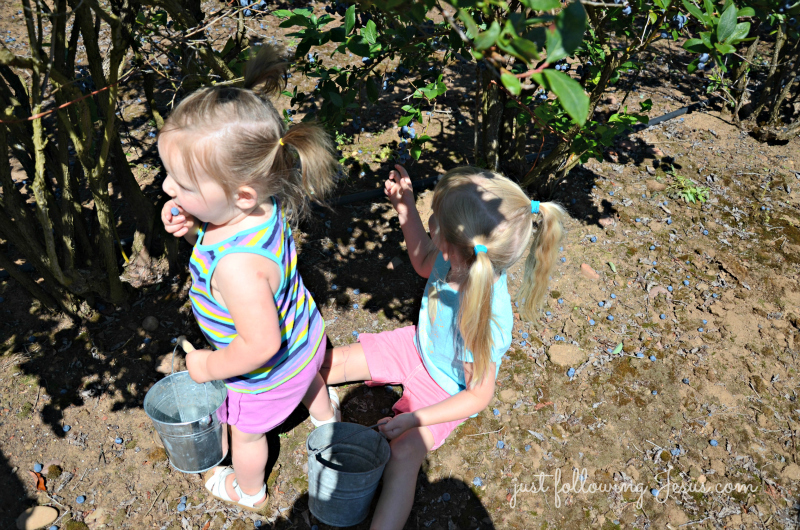 Blueberry picking....what fun! MMMMM is right. I keep eating, and eating, and eating them! 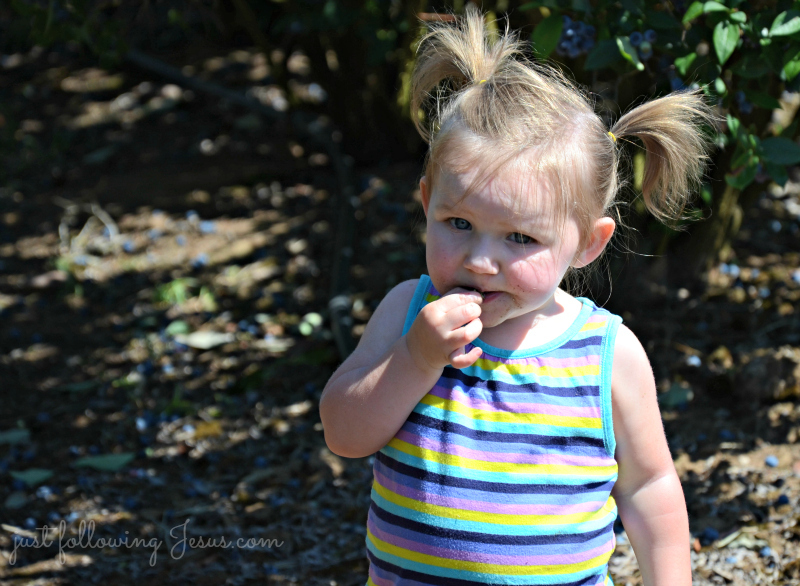 Oh, you're little one reminds me so much of "Blueberries for Sal." Elizabeth, you may have always been as good a writer as you are now but it seems to me that God just keeps taking you to new levels with your writing. I love looking forward to these Wed. (for Thurs.) gems each week. You're something else friend. I love you bunches. I'm not a grandmother yet, my kids have just entered their teen years but that didn't keep me from enjoying this. :) Thanks for sharing your heaven kissed day. Of course, I love your photos with the precious little ones, but I have to tell you that it was your narration of the day that blessed me the most with this one. So well spoken! Heaven reach right down and touched you, dear friend. 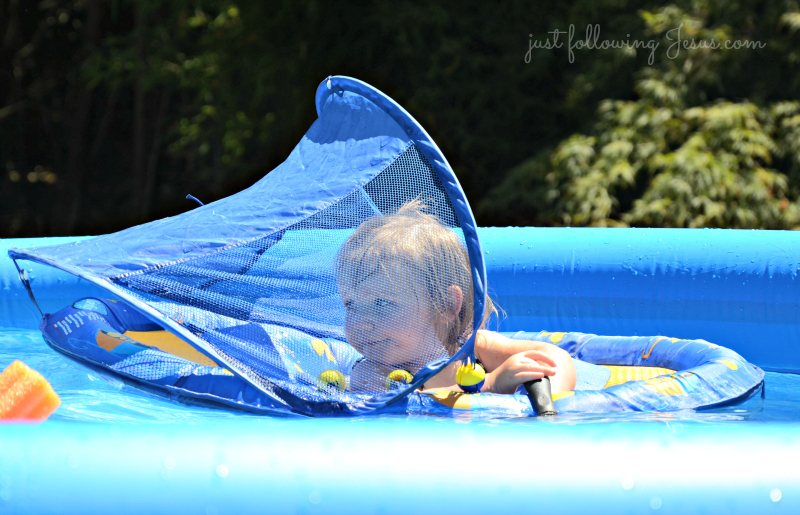 Love those sunny days filled with memories that never leave the heart! beautiful pictures, your camera and skill is amazing. 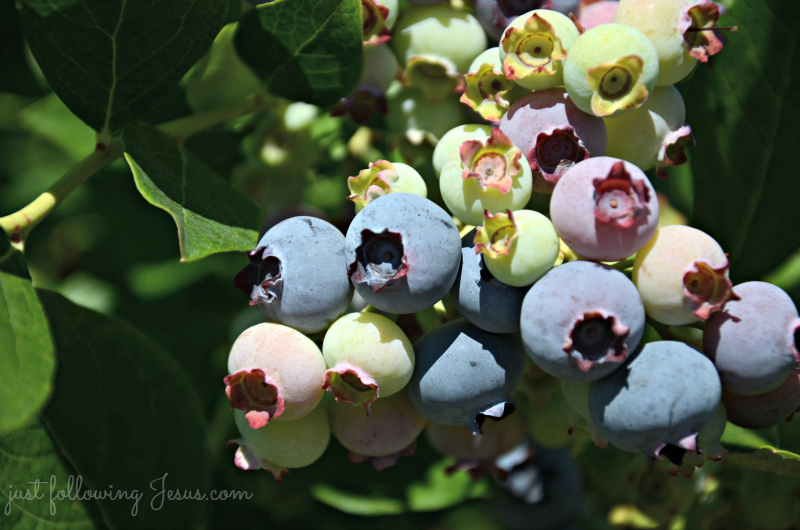 wow blueberries, they are so good. Simple and yet so yummy. So glad you had a wonderful day. I love those kinds of days. Lovely day,lovely writing. Lovely photos from was clearly a lovely day! I can't wait for the day when I become a grandma. My son and his wife keep saying, "Not yet, Mom." Thank you so much for sharing your beautiful day. 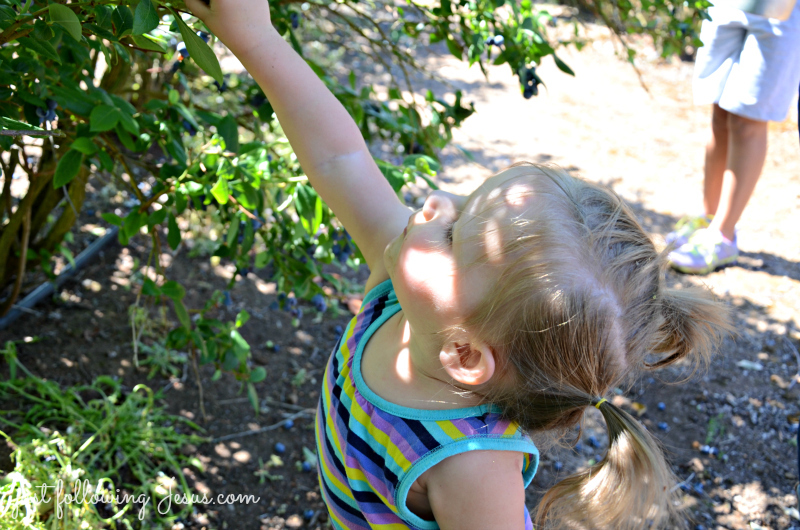 Have you read your grands "Blueberries for Sal?" My grown up kids still remember that story fondly. Lovely! I'm smiling as I type.